Into the Woods was a Broadway musical with music by Stephen Sondheim and is now a movie. It’s set in a mythical kingdom, populated by a childless baker and his wife; a wicked old witch (Meryl Streep); Rapunzel, whom the wicked witch passes off as her own daughter but who is really the younger sister of the baker; Cinderella (Anna Kendrick); Cinderella’s wicked stepmother and two wicked stepsisters (“beautiful of face and black of heart”); not one, but two, handsome princes (Chris Pine and Billy Magnuson); Jack (of “and the beanstalk”) and his harried mother (Tracey Ullman); Red Riding Hood and a hungry wolf (Johnny Depp); and an angry female giant who is at first mistaken for an earthquake. They all sing at the full capacity of their lungs (except for the giant) and they all want something. Desire of some kind seems to be the subtext for all fairytales. There are some funny moments, as when the wicked stepmother cuts off part of each of her daughter’s foot (“If you’re married to a prince,” she says, “you won’t need to walk.”) to accommodate the slipper that Cinderella left behind as she was fleeing the ball at midnight; and when the baker and his wife attempt haplessly to get their hands on the articles (Red Riding Hood’s cape, a white cow, a golden slipper, and hair as yellow as corn) the wicked witch requires to reverse the spell she has placed on them that has made them childless. Also funny is the scene where Meryl Streep is transformed from an ugly witch into a beautiful witch, making her look like a drag queen. To me the Stephen Sondheim music is unmelodic and highly forgettable (not exactly Rodgers and Hammerstein), but Into the Woods is beautiful to look at, with engaging and likeable characters (except for the wicked stepsisters, one of whom smacks Cinderella in the face and knocks her down). Not a bad way to spend a couple of hours between Christmas and New Year’s. I just wish I could have seen more of that angry female giant. 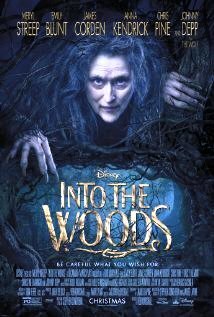 Posted in Uncategorized and tagged Allen Kopp, capsule movie review, Into the Woods. Bookmark the permalink.